Yes, I’m getting blog titles out of Romanian Christmas crackers now. That’s not true, I haven’t pulled a Christmas cracker* since retiring (in fact getting out of Xmas work lunches was the 3rd biggest incentive to retirement, as I recall). Tuesday took me to the beautiful Travelodge at Oxford Pear Tree Park & Ride, where Mrs RM had already spent a miserable birthday on her own eating discounted Co-Op sandwiches. Our route avoided the entirety of historic Oxford, which would have been no fun in the traditional Christmas week drizzle. On the short walk from the Bullingdon Club we passed a crowd of beardies queueing outside St John the Evangelist, occasional donnish gig venue. “Steve Hogarth” said the sign. Ah, the Beer Street/Gin Street man, I assume. No picture of the outside of the Fir Tree, but plenty of quirky interest on several discrete levels inside. And look on that ledge ! Michaelamas term had ended, so the custom was from a pleasant mix of locals old and young, without the big Christmas groups you feared. Perhaps that’s because the short menu didn’t include Christmas-themed pizzas. Pleasingly, just the one silly Christmas beer, too, the one I therefore bought Mrs RM. Other customers were getting very excited by the East Coast IPA. Greene King would have been thrilled. If it was in Cambridge it would be the Alexandra, an unpretentious, cosy Greene King place with cheapish food and beer. I had the dregs of the Rosie, Mrs RM hinted at an NBSS 3.5 and I’m sure she’s right. The pizza was doughy and interesting too. The banter was worthy of NBSS 4.75. I quote verbatim, having been on the chilled water. Yes, we were in the midst off Marillion fans from all over the country, come to see their boy band’s lead singer on his solo tour. They were great fun, much better than the usual Pub Amateurs you get at Christmas, and as they left to stand in the rain at St John at 6.57 were replaced by an even better species of pubber, the monied Oxbridge excitable. You’ll have to imagine the Oxford drawl. “She’s in a non-sexual Sugar Daddy situation“. Mrs RM was entranced. The music was playing too low, but I made out Weller’s “Changing Man” and Suede’s “Trash“. A bit like Radio 6 Music, it’s always 1996 in Oxford. A cracker, even if a cracker from a bygone age. Time for the Butcher’s, beautifully tucked away near the Shark and the old Manor Ground. Again, a really cheery mixed crowd, akin to the Five Bells off Mill Road in Cambridge. I bought Mrs RM the one with the Christmas hat, which was oddly served out of the London Pride pump. Pretty good too, though she left me only tiny dregs and seemed more interested in the toilet twinning. I went off to see the Shark, forgetting it was nighttime. Anyway, I think the shark has jumped the shark and we’re all onto houses emblazoned with signs retained from dead pubs now. ** I’m hoping if this blog survives the End of Times like in A.I. Artificial Inteeligence it will be incomprehensible to aliens. There’s a certain fellow in the US (in Texas?) who thinks 6X is the bestest beer ever. Talking about the Kama Sutra is my guess. Obviously a better view from that one. All those Sharknado movies have put the nail in that coffin. Aaaaah! So close and yet so far, I wasn’t in *that* Pub, but I was in Town for that gig…..I felt I had to tell you as the excitement of being so close to beer/pub/music blogging royalty is quite something! Alas I never saw you and twice alas as I out myself forever as a Marillion fan! (I bought Market Square Heroes thru to Straws and mate is big Fish fan). Thank you champagne,sloe gin,whiskey and tonic,more sloe gin,expensive Spanish wine someone bought me and finding the eldest son’s stash of weed for getting me through another Christmas Day. Do you think you will sleep through the night better now that Christmas is out of the way ? Wouldn’t “Art for art’s sake”, by 10cc have been a more appropriate title for the post Martin, given the shark diving through that roof? Also looking at the angle of approach, I’m wondering what’s holding it up. More to the point, what do the neighbours think? And how on earth did this “structure” pass planning consent? I never paid much attention to Fish and Marillion. People used to describe the band as a “poor man’s Genesis”, but I imagine they stayed much closer to their Prog roots than Phil, Mike & Tony ever did. ps. I have fond memories of trips to Oxford, back in my student days; and even fonder memories of drinking Morrell’s beers, in some classic back-street pubs. Certainly a classic blog title for future use, Paul. 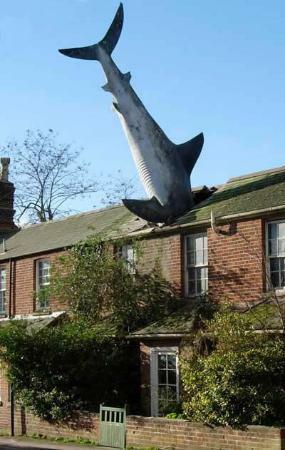 I think the shark ate the neighbour. I believe retrospective planning permission WAS sought but the Council is more concerned about non-traditional garden gnomes in Jericho. Given that the shark’s owner, Bill Heine, is a well-known radio presenter, the title could have been a twist on “Video killed the radio star”. Not so much retrospective planning permission – the shark ended up in the High Court before being reprieved by Michael Heseltine, then Secretary of State for the Environment. There’s loads about it online. “Also looking at the angle of approach, I’m wondering what’s holding it up”. A steel frame, whilst the shark itself is lightweight fibreglass. Scaffolding has to be erected periodically whilst it is maintained and cleaned. Thanks for enlightening me, Fred. Continuing with “Video killed the radio star”, the allusion to Trevor Horn, overhead by our intrepid pub explorer, is certainly most appropriate. Thanks, Fred. Really appreciate the detail. That’s confirmation,if needed, that Michael Heseltine should have been PM (I’m not saying when). Great haircut AND he reprieves fibreglass sharks. “Michael Heseltine should have been PM” – well, I would suggest that he, Portillo and Clarke were more capable than William Hague, Iain Duncan Smith and Michael Howard. Dennis Healey might have been quite jolly too. The bar’s not very high with the most recent two, though is it? Are we agreed then that Michael Heseltine is the greatest PM that we never had ? Well, either him or Alan Johnson.